I have no hard and fast rule for pressing. I generally press my seams in the direction they want to go. When pressing blocks like HST's I press my seams open, but for simple patchwork I like to press to the darkside. I then press my seams open when attaching rows together to avoid bulk. But find a way that works for you and be consistent with it. I've include a photo of the back of part of my block so you can see how I've pressed my seams. 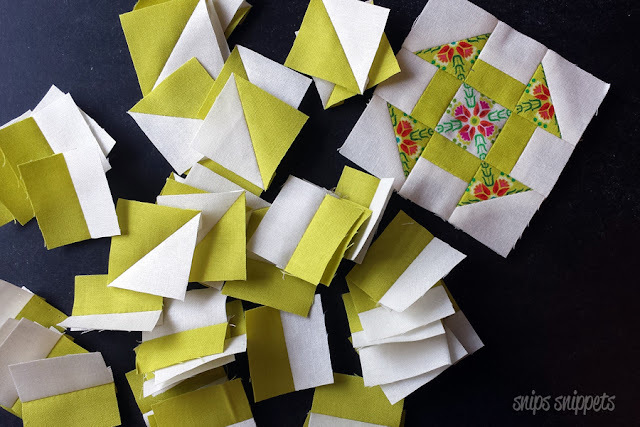 First up, gathering and cutting your fabrics, cutting instructions for this block can be found on page 11 of your instruction book. I've gone with a large variety of prints and solids for this block but kept within a specific colour scheme. I almost want to remake all my blocks in this exact colour palette now. Almost. We're going to start by making our HST's, I found it easier to pick fabrics for the pluses after I had made the star block. You need eight half square triangle units total. 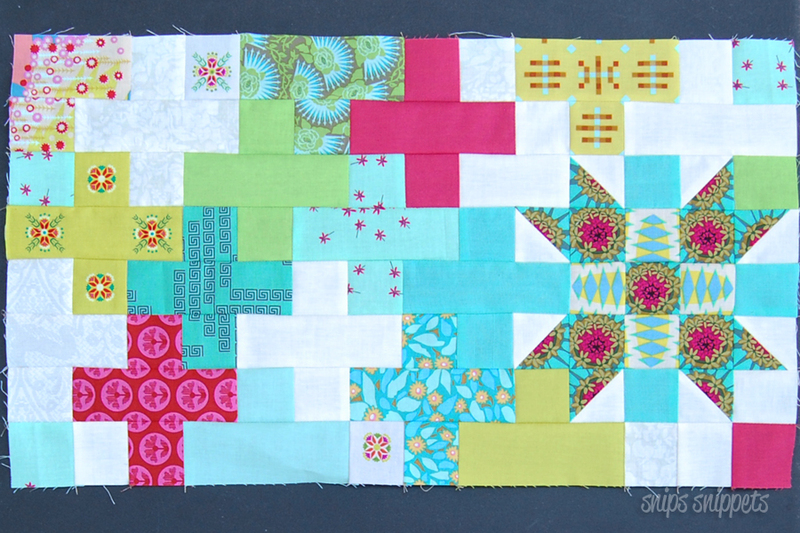 Now using your design wall, arrange the HST's with the squares for the nine patch unit to form your star block. You may want to think about which fabrics you use for the background of the HTS's as they become part of the plus blocks. I wanted to stick with my cream solid for my background so I just made sure to make two of the pluses cream. Now the instructions would have us sew the nine patch pieces into a nine patch block. Don't. Leave them unsewn as we will be sewing the pieces together into columns once we get the pluses sorted. 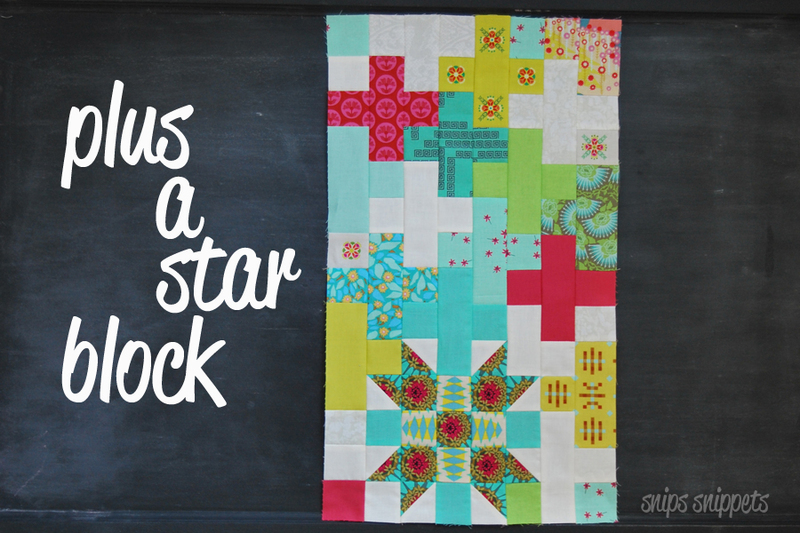 With your star block up on your design wall, start filling in the plus blocks. I cut mine as I went, I just found it easier that way. But if you want to cut all your pieces out first that works too, just note that the instructions call for 16 of the larger rectangles for the plus blocks and you actually only need 15. Keep arranging and rearranging until you find that happy place where everything is just where you want it. In my case, that involved a lot of pluses cut out and not used, as well as a couple of HST's that I thought would work but in the end I just wasn't feeling it. Lately I've been embracing my new found ability to cut into fabrics without fully knowing if I'm going to actually use them in the project. I'd much rather cut up a bunch of fabrics to find that perfect fit than settle for something that I'm just ho hum with. And besides, I can always use the cut up bits in another project right?! So once you have your pieces arranged in just the right way it's time to sew them up! I found it easiest to transfer the pieces in rows of two to a scrap piece of batting then carrying that to my machine. Keep your pieces in the proper order and you won't have to worry about things getting mixed around. I worked in columns of two, sewing them together, then pressing the seams open as I went. And before you know it, BLAM! Hope you all enjoy the ease of this one because next week we tackle the little churn dashes, and there's a lot of them!! 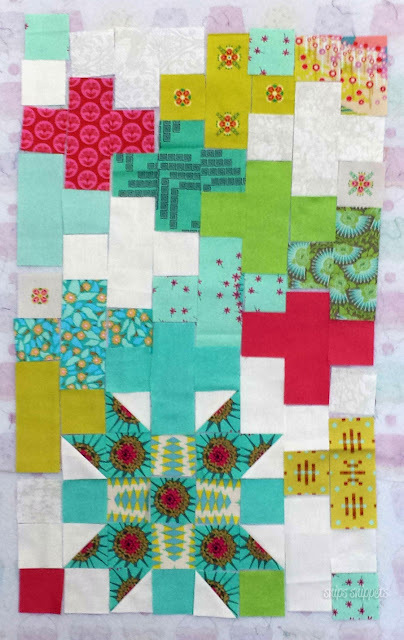 Don't forget to pop over to Angie's by clicking here, to see her block, it has some serious POP to it!! And to also find out what handy tips and tricks she has! Post a photo of this weeks block to your Instagram account between 12:01am April 19th and 11:59pm April 25th 2017 in your timezone. When this post goes live I will be on a plane to Walt Disney World (wahoo!!) to celebrate my birthday with my two little guys and my mom and little sis. I will do my best to answer any questions asked but please be patient. I don't know how great the internet will be at our resort. That and I'll be having too much fun! Haha! Also, there have been a lot of no reply bloggers leaving comments. If you want a reply please leave your email address in the comments. Or google "no reply blogger" to find out how you can become a "reply" blogger. Thanks!! So that's it for this week, have fun and don't forget to use a design wall, it will help immensely! All the high fives go to my little sister this week for taking us to Disney! Ooh I loved the grey with turquoise flecks on your half squares that you opted not to use. 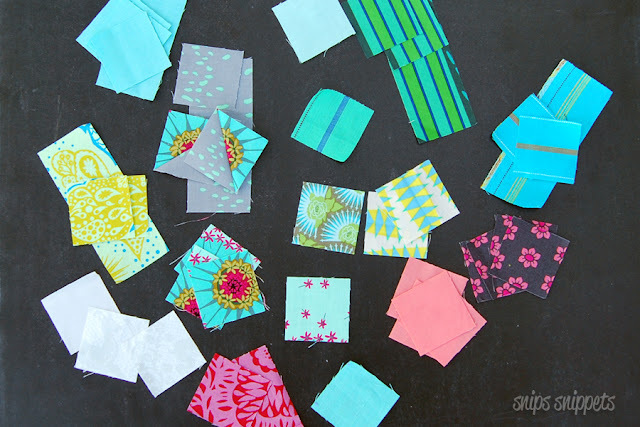 Definitely use them in something else or incorporate them into the backside of this quilt! And thanks again for all the outstanding tips. I'm learning a lot on this adventure! I love your blog, thank you for sharing the tips. The tecture looks awesome to me. I look forward to your next article Keep up the good job.